As a fado singer, Portugal’s Ana Moura has an innate sense of drama. 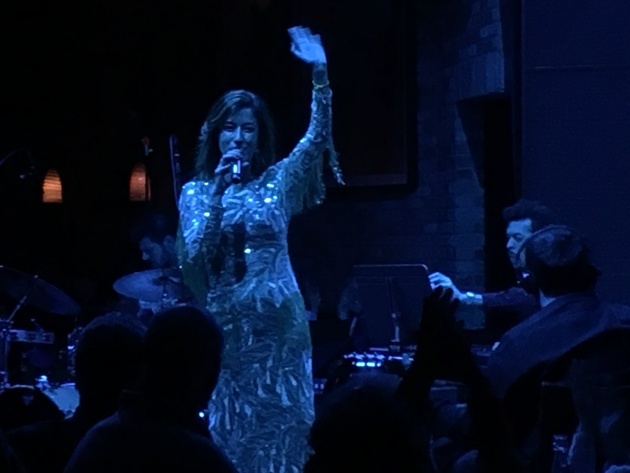 So when she returned to the sold-out Dakota Jazz Club on Monday for the first time in five years, she waited until the middle of her unforgettable 95-minute set for the big reveal. While her band played an intriguing instrumental, Moura changed from a dark, shimmering dress to a white gown with gold sequins. Now was the time and Minneapolis the place for Moura, 38, to sing “Dream of Fire” for the first time in public. The lyrics were very Princely, with several mentions of dreams and “miss” rhyming with “kiss,” something about "a heart’s desire" and about "words unsaid" – all delivered with as much loving passion as the dusky-voiced Moura can muster when singing in English. Only one other selection in the program was in English – her treatment of the Rolling Stones’ “No Expectations,” which she’d recorded with Stones drummer Charlie Watts for a Stones tribute album that featured singers from around the world. The tune and tempo were familiar, embellished with her distinctive quiver and breathiness, before fading out with her humming the chorus. Yet she somehow summons the sorrow and sadness of fado, Portugal’s traditional blues. Performing under dim lights of either blue or red hues, the dramatic, demonstrative vocalist would often turn to her instrumentalists and sing to them, with the acoustic guitarist or the Portuguese guitarist (his instrument sounds like a mandolin with a fuller resonance) responding as if they were having a conversation with her. Moura performed a few traditional fado tunes as well as some fado originals (loved “Loucura” with its deeply emotional vocals and wonderfully expressive Portuguese guitar). She offered a pop-ish tune that sounded as if it could compete in a Eurovision songwriting contest. And she delivered several uptempo dance numbers with clap-along cadences that were quite a contrast to the slow, moody fado with its tempos of a dripping faucet. This performance was a far cry from Moura’s cameo appearance at the October 2016 Prince tribute at St. Paul’s Xcel Energy Center when she tried to rev up “Little Red Corvette” in front of 17,000 grieving Purple fans. Something was lost in the translation that night. Monday’s performance was more memorable for so many reasons.